Crescent is a 2013 young-adult science fiction novel by Homer Hickam, the second of his Helium-3 books. Here, Crater befriends an enemy mercenary as he gets into various moon shenanigans. First, a note: I didn’t particularly care for the first book in the series. I only read Crescent because Hickam saw my two-star review of Crater on Amazon and came and found me on this site. He encouraged me to give the series another chance, and I agreed to read the next one. So here we are. Crescent is a definite improvement over the first book. Crater himself has become a more interesting character. He’s complex and somewhat inscrutable, he isn’t nearly as insecure as he was in Crater, and he has a number of very good moments. Crescent, too, is a sympathetic and engaging character, even if her arc covers well-trod ground. We do less well with many of the one-dimensional supporting characters – the brutal-dictator-turned-small-time-sheriff is tough to take seriously, and the three slacker legionnaires (whose chapters could have been omitted completely) give us four out of four supposedly-fearsome crowhoppers turned cuddly. The romantic tension and conflict between Crater and Maria fails to generate much interest. Again, Hickam’s mining and aerospace background shine through, as he provides immersive detail, good science, and reasonable conjecture about all things related to piloting, the moon, and space. Apart from this, though, the writing has problems. Conversations are frequently stilted; there aren’t enough contractions. Too much dialogue is “growled.” Most damaging, the story is all over the place, meandering and full of detours. Crater is doing everything – plot element after plot element is picked up, only to fall by the wayside, leaving the reader to wonder what, if anything, is really important to whatever the story might turn out to be. It seems as though Hickam had a number of themes he wanted to hit (if you missed any, he recounts them for you in his author’s note), and so in they went. 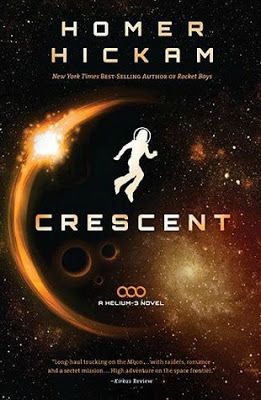 Crescent also lacks anything remotely resembling a climax – Hickam assembles his ragtag group and the book ends, leaving the reader to feel like the whole thing’s been little more than setup for what surely must be a more interesting third book. While I feel that the Helium-3 series is definitely trending upward, Crescent has enough problems that I had something of a hard time just getting through it.